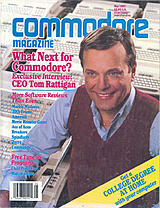 Cover Story What next for Commodore? Exclusive interview: CEO Tom Rattigan. 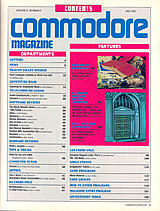 More software reviews than ever: Marble Madness, 10th Frame, Amnesia, Movie Monster Game, Ace of Aces, Breakers, Spindizzy, Zorro, Commando. Free type-in programs: chold proof cap, multiwindows.